Volcano Vs. "Iron Man 2"? No Contest! 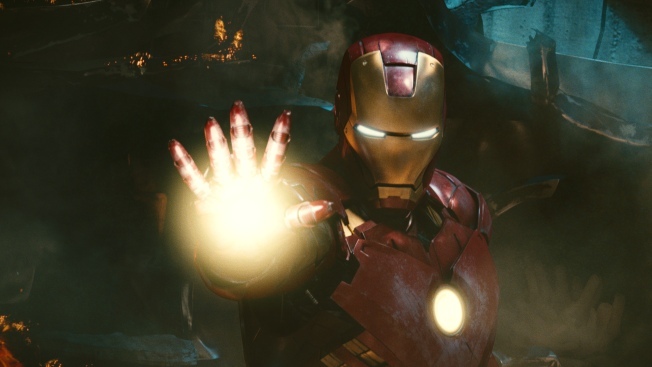 In this film publicity image released by Marvel Entertainment, the character Iron Man is shown in a scene from "Iron Man 2." The continued grounding of planes in Europe means Miley Cyrus must skip a trip to England, forced the world premiere of "Iron Man 2" to be moved from London to Los Angeles and prevented Sharon Jones & The Dap Kings from performing on "Late Show With David Letterman." But if you're a citizen of Iceland stuck in New York, you can score free tickets to "The 39 Steps." Hundreds of thousands of passengers have been stranded around the world since a volcano in southern Iceland began erupting Wednesday, leaving a cloud of volcanic ash hanging over Europe and shutting down airports from England to Germany. Restrictions were starting to ease Monday, but not in time to prevent numerous postponements and other disruptions in the entertainment industry. Cyrus spokeswoman Meghan Prophet of PMK-BNC said Monday that the actress-singer would miss the British premiere of her current film, "The Last Song," scheduled for Tuesday in London. Paramount Pictures and Marvel Entertainment announced they had moved the "Iron Man 2" premiere, scheduled for April 26, "due to the continuing air travel uncertainty." Organizers of the Tribeca Film Festival were monitoring the situation for filmmakers and actors planning to fly from Europe for the New York festival, which begins Wednesday evening. Festival spokeswoman Tammie Rosen said they were "taking it flight by flight," trying to reroute those with canceled flights and making contingency arrangements in case the delays extend through the week. "Late Night With Jimmy Fallon," ''The View" and "Live With Regis and Kelly" were among the television shows reporting no changes in programming. But "Late Show With David Letterman" spokeswoman Kim Izzo said that Jones&the Dap Kings, scheduled to perform Monday for a show airing Friday, had been on a European tour and were "still stuck overseas." The London Book Fair opened Monday despite the absence of numerous publishing officials from the United States and other countries. HarperCollins publisher Jonathan Burnham had hoped to attend the London fair, calling it a "significant exchange of information in the publishing calendar for international publishers." "For corporate publishing houses with operations on both sides of the Atlantic, there's a great deal of useful activity in London, not just between publishers and editors, but between sales representatives, digital development groups, rights departments and so forth," Burnham said. A planned book party in New York for John Banville was canceled because the Irish author was unable to fly over, publisher Henry Holt and Company announced Monday. W.W. Norton and the literary agency Sterling Lord Literistic canceled a reception for a book about the late Muriel Spark because biographer Martin Stannard could not make it from London. French actress Catherine Deneuve and Hong Kong businessman Sir David Tang, founder of the Shanghai Tang chain, were unable to attend the Savannah College of Art and Design Etoile Awards, where Monday night they were being honored in New York as "trendsetting visionaries" of style and design. "Don't spend one more evening on a cot at JFK," producer Harriet Leve said in a statement. AP Television Writer Lynn Elber, AP Entertainment Writer Sandy Cohen and AP Movie Writer David Germain in Los Angeles, and Drama Writer Michael Kuchwara, Television Writer Frazier Moore and Entertainment Writer Jake Coyle in New York contributed to this report. VIEW THE PHOTOS: Robert Downey Jr. PLAY IT NOW: 'Iron Man 2' Blasts Into Theaters With More Stars & More Action!